Building Blocks Play Group New Paltz offers full day preschool and daycare for children from 2.5 to 5 years, from 7:30 am to 6:00 pm. Part week and half-day options are also available. We also provide before and after school care for school-aged children. Our preschool is located on Laura Drive just a half mile from Lenape School, in New Paltz. Please visit our Enrollment page to request more information or call 845-208-5700/646-320-9903. We strive to provide New Paltz families with a safe, stimulating, fun and educational environment. 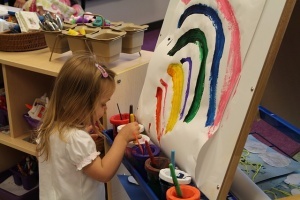 We utilize various educational methods in our preschool curriculum, such as Montessori and Reggio Emilia. Cooking, science, music, and art are a big part of our preschool environment. We offer live, password-protected webcam access of the classroom for families of enrolled children free of charge. We value and understand the importance of a small teacher to child ratio to facilitate the learning process, so we maintain a teacher/student ratio of 1 teacher for every 5 students. We strive to be the highest quality choice for preschool in the neighborhood. Our schedules are very flexible and we will work with families on a case by case basis to provide you with care for your child when you need it.